Asian history and culture have fascinated me from my youth. I suspect it started with a weekly television feature that showcased imported martial arts movies. The physicality of the fight scenes was mesmerizing. The fact that the audio dialogue never matched the movement of the character’s mouths only added to my curiosity. What were they really saying? Why did they dress that way? Is everyone in their town a martial arts Master? How can I get one of those swords? With time and a little maturity, the scope of my curiosity has developed slightly to include Asian art, history, philosophy, etc. 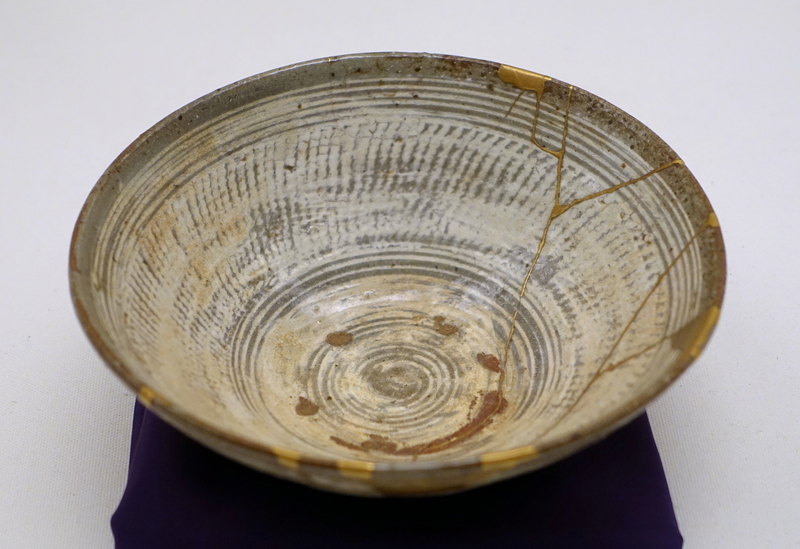 A recent interest has to do with something called “kintsugi.” It is both a procedure and a philosophy. Kintsugi “golden joinery”, also known as kintsukuroi, “golden repair”, is the Japanese art of repairing broken pottery using lacquer mixed with powdered precious metals. As philosophy, it acknowledges the wear and breakage of an object as part of its history. Rather than warranting its disposal, repair becomes a beautifying event. The vessel becomes a treasured trophy that demonstrates the wealth and grace of its owner. 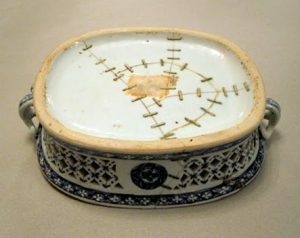 One possible origin of kintsugi may have been when Japanese shogun Ashikaga Yoshimasa (lived from January 20, 1436 – January 27, 1490, and reigned 1449-1473) sent a favorite broken tea bowl back to China for mending. As the story goes, when it was returned sporting ugly metal staples, Japanese craftsmen were prompted to develop a more aesthetic approach. Collectors were so impressed with this new approach that they intentionally damaged their own valuable pottery only so it could be repaired with beautiful seams of gold. Kintsugi has no biblical connection. It is a humanistic philosophy. However, there are underlying principles that resonate with the ideas of biblical brokenness and redemption. The Bible tells us that we are born “broken.” The sin (Genesis 3) of Adam has resulted in each one of us entering this world alienated from God, our Creator (Romans 5:12-14). Additionally, each one of us is born with a default propensity to commit personal sins (Ephesians 2:1-3). Finally, we are born into a fallen world battered by the malicious influence of fallen angels (Ephesians 6:12; 1 John 3:8). The Bible says there’s nothing any one of us can do to turn this around (Romans 3:23-26). We are born shattered; individually and collectively. We are fit for little more than a cosmic burn pile; disposed of… discarded. Our only hope is to be redeemed. There is no other possible solution. Our Maker, Himself, in His great wisdom and lavish grace, has entered into the flow of humanity (John 1:1-14) for the purpose of redeeming the human race. He has taken upon Himself the tedium and fragility of each one of us (Hebrews 2:14-17). Born in perfect relationship with God, and free from our irresistible propensity to sin; He is flawless and well able to resist the corrupting influence of the fallen. Nonetheless, He submitted Himself to the fate of the broken in order to redeem the broken. He submitted to death. And when He rose from the dead three days later, He demonstrated that the power of sin and death over the broken had been destroyed. This redemption is not automatic. While the death and resurrection of Christ are universally powerful, they require your personal response to become personally beneficial. Your appropriate response to Jesus will change the very paradigm of your life. Reconciled to God through the blood of Jesus, God invites you into intimate relationship with Himself. In the Person of His Holy Spirit, He will actually take residence within you. As you nurture connection with Him, by way of attention to His Word and prayer, transformation into wholeness and holiness will occur. Relationship with other redeemed vessels will prepare you for an eternal place in Heaven. You will become nothing less than a living trophy of His great grace; on display for all Heaven and Earth. Good Friday and Easter Sunday have come and gone, but the significance of what they commemorate never diminishes. Every day is full of hope and opportunity because of Jesus Christ. Don’t let a single one pass without responding appropriately. Recognize your own personal brokenness and receive God’s lavish redemption in Christ. Be reconciled to God. Savor and celebrate your relationship with Him. Explore the wonders of His Word. Invest yourself into the privilege of prayer. Submit to His process for transforming you into a treasured trophy of His grace.